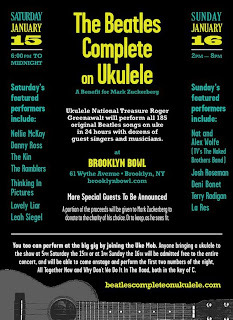 Experience the entire Beatles discography like never before as Roger Greenawalt and special guests Nellie McKay, Leah Siegel, and The Ramblers attempt the feat of covering every single Beatles song on ukulele! Wanna play? Bring your uke to the show at 5pm (and on Sunday at 1pm) for free admission and to perform on stage in Uke Mob’s play- and sing-a-long.